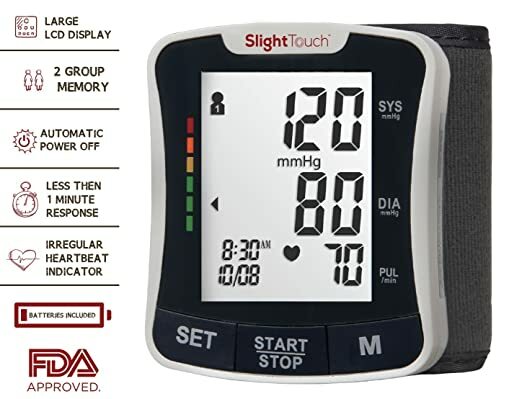 Now you can monitor your blood pressure with clinically accurate results by using this slight touch fully automatic wrist blood pressure monitor ST501. 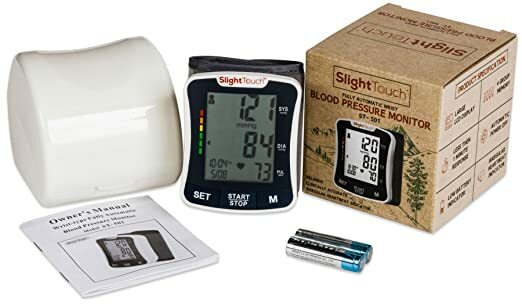 Why should you buy this slight touch blood pressure monitor? It is easy to use and is clinically accurate. It can keep track of up to 60 readings each for 2 people, with an average of your last 3 readings. It is FDA approved. It has an extra-large LCD display so it is easy to read. It powers off automatically. It has an irregular heart beat and who indicator as well as a low battery indicator. Carrying case and 2 AAA batteries are included. 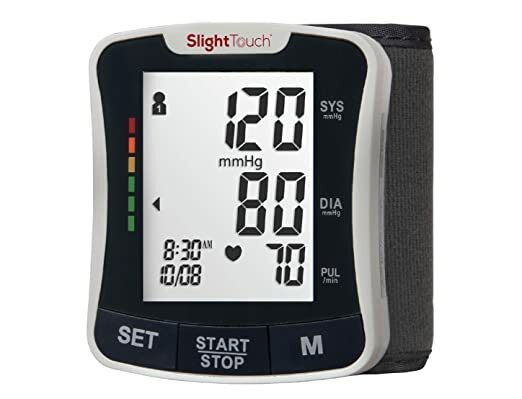 Product specifications: Pressure accuracy: +3mmhg, pressure range: 0 To 300mmhg, pulse accuracy: +5%, Pulse range: 30 To 180 beats per minute, LCD size: 1.9" x 1.5", Power source: 2 AAA batteries included, battery life: About 2 months with 3 tests a day. 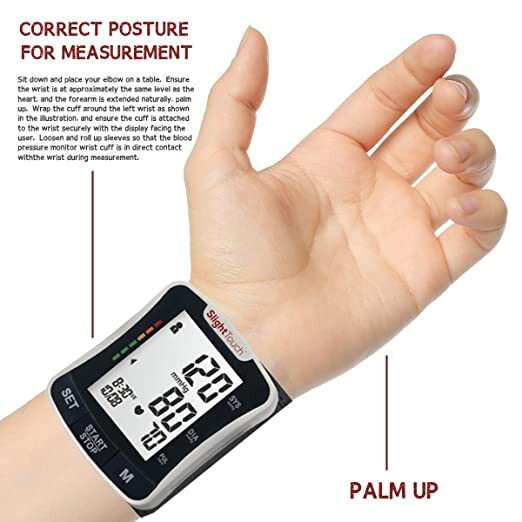 To get the most accurate results when testing: Test the same time every day, put the cuff on in the right place as per instructions, on your wrist. For best results, use your left wrist as it is closer to your heart. 30 minutes prior to testing don't eat, exercise, smoke or drink alcohol. While testing sit in a relaxed position with your feet straight in front of you and your wrist at heart level. Do not cross your legs. 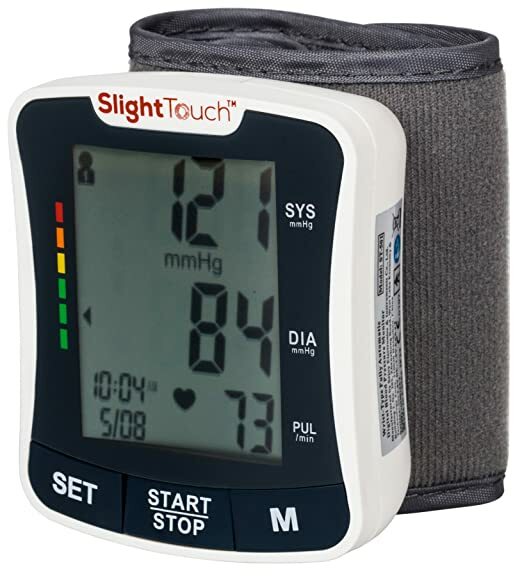 Stay on top of your health and track your blood pressure using this slight touch blood pressure monitor. To Recieve updates and possible rewards for Slight Touch USA ST-501 please sign in. To Recieve updates and possible rewards for BP Monitor please sign in.